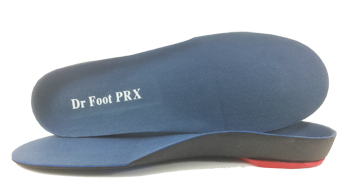 Dr Foot PRX Orthotic insoles are full length with arch supports, metatarsal and heel cushion for plantar fasciitis and flat feet treatment. 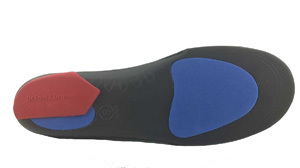 A 2 degree rear foot wedge lifts the sustentaculum tali section of the heel and eases plantar fasciitis. Forefoot and Heel protections with a supportive arch support. Foot Orthotic Insoles are contoured to improve the foot to function correctly and eliminate pain. Made from supportive EVA and designed to support & help re-align an over pronating foot, which is the main cause of many foot conditions including heel pain, plantar fasciitis and arch pain. Conditions Treated: Plantar Fasciitis, Flat Feet, Painful Arches, Shin Splints, Over Pronation, Ankle Pain, Heel Spurs, Morton's Neuroma, Bunions, Metatarsalgia, Aching Legs, Knee Pain and Lower Back problems. Ideal for athletic shoes, boots and casual shoes. Please note that they can be trimmed with scissors to fit the shoe, should they be too long. PROVEN PODIATRIST DESIGN - Designed by podiatrists to help you combat foot pain. Proven by thousands of satisfied customers who order repeat pairs. In addition they are also highly effectively methods for relief against other common foot related issues such as flat feet and leg and back pain. Extra EVA foam padding in the heel and at the ball of the foot provides relief in these high shock areas. These insoles are designed to be trimmed to fit perfectly inside your shoes.